I LOVE English Toffee! I have a recipe on the blog that everyone should try. There is an art to candy making - they key for me is a candy thermometer. 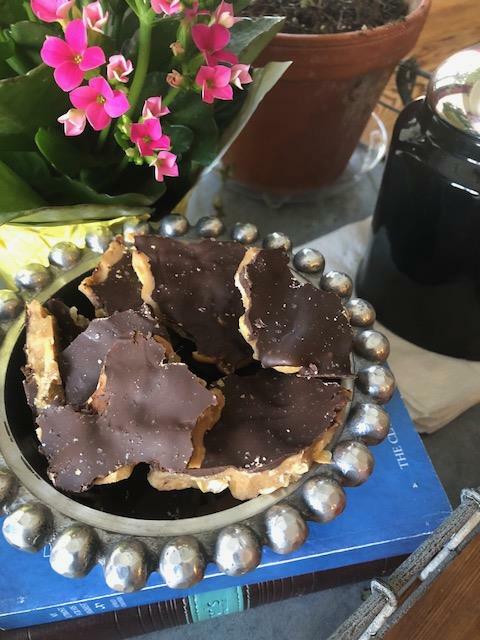 I usually make Milk Chocolate English Toffee with Cashews. We are having a teacher appreciation day at preschool today and decided to change up my toffee just a little bit. 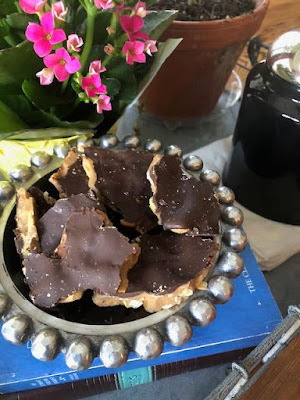 I made Dark Chocolate Sea Salt English Toffee - WAY yummy too! Butter a glass dish. Sprinkle with cashews... or any nut. In a heavy pan, cook butter, sugar and salt on medium high stirring constantly. Bring to a boil and boil for about 12 minutes or until your candy thermometer reaches hard crack stage - don't give up. The mixture will turn a golden color. When it reaches about 302 degree F, pour evenly over cashews. This hardens immediately so pour it where you want it to go. Top with chocolate chips ....evenly over the top. Allow a minute or so to melt and spread with a knife. Sprinkle with sea salt. After chocolate has hardened, score with a knife and cut into squares or break apart. Enjoy this TO DIE FOR treat!